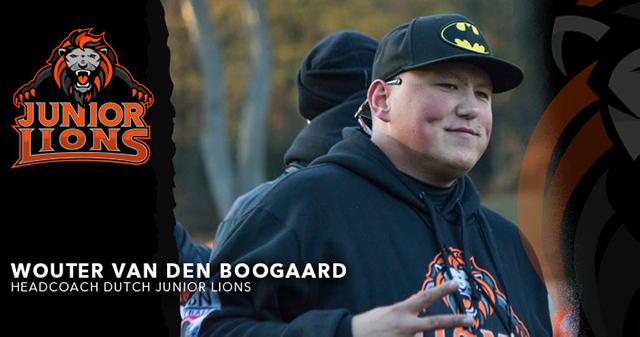 Wouter van den Boogaard ’10 ΒΘΠ is living his version of the American dream as head coach of the Dutch Junior Lions Football Team, a post he accepted in August 2017. 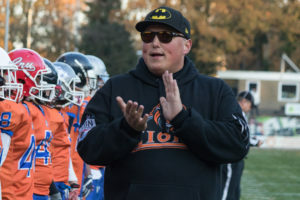 Coaching American football in his native country of the Netherlands is exactly what “Coach Bogey” — as his players and colleagues refer to him — always dreamed of. In a rare break from year-round practice, Westminster recently caught up with the youngest head coach ever appointed to a national team in the Netherlands. We asked him about Dutch American football, what he does when he’s not coaching, and how exactly his Westminster education led him down this rare career path. How popular is American football in the Netherlands compared to soccer? Football doesn’t even compare to soccer. 1.2 million people play league soccer in the Netherlands, where the Dutch Amateur Football League only has about 2,500 members. How did you get into coaching? I started coaching football at the age of 19 as an assistant offensive line coach for the Dutch Junior Lions, the Dutch National Youth Team U19 of which I am currently the head coach. I played in the team before, and when my eligibility was over, I joined the coaching staff. During my years at Westminster, I would always coach football over the summer breaks in between semesters. What other sports do you enjoy? I watch a little bit of soccer here and there, but football is where it’s at for me! Please describe a typical day on the job for you. On Dutch Junior Lions practice days, we start at 08:30 at the facility with a full staff coaching meeting, then we move on to offensive and defensive meetings. We’d normally have a two-a-day practice, with a film session and several meetings in between. After the second practice we break the film and distribute that through Hudl, the online video program that we use. What organizations outside of work are you involved in? I have been involved in setting up a football academy for young kids to learn the fundamentals in football. I’m also head coach, offensive coordinator, and offensive line coach of a club team, the Ostend Pirates, which is a position I began in July 2018. If you hadn’t chosen coaching, what field of work would you have chosen? Coaching is actually not a full time job, it’s a side gig next to my work as an account manager for American Appliances BV. What made you choose Westminster College? I always wanted to play football in the USA and to get a college degree. A coach that was at Westminster then had some ties to my former head coach in Europe, they connected, and that’s how it all got started. What was your major at Westminster? I was a self-design major: International Business Communication. How did your Westminster education help you find your purpose? My Westminster experience didn’t really sink in until I got into the real world: the diversity on campus, the friends I made, and the tools that my education gave me. Which of your achievements are you most proud of? Graduating while not being a native English speaker is something that I’m very proud of. I still have my degree hanging in my office, and it gets plenty of notice. Graduation still holds a special place in my heart. Walking through The Columns is something that I will cherish the rest of my life. Would you recommend Westminster to prospective college students? I would definitely recommend the Westminster experience to any prospective student that’s looking at a smaller school. The personal interest from professors and interactions with a diverse campus like Westminster benefits every student that takes part in it. “Coach Bogey,” as his players call him, and his living companion, Marie Yankey. Significant other? 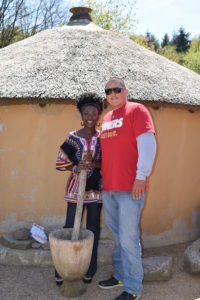 My living companion is Marie Yankey. We are currently expecting a boy in February! Favorite Westminster faculty member? Kurt Jefferson was my first mentor at Westminster when I was a freshmen, and we are still in touch to this day! He loves to talk about soccer, and me being a European made that easier. I took as many of Professor J’s classes as I could, and a semester without one just wasn’t the same. Favorite spot on campus? The Beta house, hands down. A book you would recommend to others? Finding the Winning Edge by Bill Walsh. What do you do in your free time? We love to Netflix and chill!